Researchers in Uppsala, Sweden accidentally left a reaction running over the weekend and ended up resolving a century-old chemistry problem. Their work has led to the development of a new material, dubbed Upsalite, with remarkable water-binding properties. Upsalite promises to find applications in everything from humidity control at home to chemical manufacturing in industry. Maria Strømme and colleagues at Uppsala University, whose work appears in the journal PLOS ONE, have modified a procedure dating back to 1908 to make a powdered and dry form of magnesium carbonate (MgCO3). The reaction ingredients are all cheaply available: magnesium oxide (MgO) and carbon dioxide (CO2), dissolved in methanol, a common industrial solvent. The result is pure, dry MgCO3. Dry in this case means very dry. In the chemical sense, it means void of almost any water molecules at all. Crystalline forms of dry MgCO3, which lack the structure needed to absorb water, are readily synthesised at high temperatures (over 100 °C). As early as 1820, people started to search for lower-temperature routes to make dry MgCO3, but none have successfully yielded pure product until now. This is why Upsalite has been described as an "impossible material". The key modification was to increase the pressure of CO2 to three times that of normal atmospheric pressure, rather than simply bubbling the gas through a mixture of MgO in methanol. When one mixture was accidentally allowed to react over a long weekend, researchers came back to find a gel. It turns out the gel was formed because methanol molecules had been trapped within the material. When heated to 70 °C, which is above the boiling point of methanol, the gel "solidifies and collapses into a white and coarse powder". Analysis confirmed that the product was just what chemists had been trying to make for more than 100 years – a dry, powdered form of MgCO3. Upsalite has impressive properties as a desiccant, absorbing water better than the much more expensive materials that are currently used (called zeolites). Most of the absorbed water is retained when Upsalite is transferred from a humid to a very dry environment. The dry form can be regenerated by heating to 95 °C. By contrast, most zeolites need to be heated to over 150 °C in order to dry them. Not only is Upsalite easy to make and reuse, but it is also not toxic to humans, which makes it suitable for humidity control indoors. The impressive drying property stems from the very large internal surface area of Upsalite. MgCO3 is a common mineral that occurs in a variety of forms, most of which have water bound to their surface and are crystalline. By contrast, Upsalite has no water integrated into its structure and is not crystalline. Instead, it is mesoporous – a structure with pores that are a million times smaller than the width of a human hair – which provide it with a much greater surface area. The past 20 years have seen a surge of interest in mesoporous materials such as zeolites and carbon nanotubes due to their ability to selectively absorb small molecules, which may enable applications in drug delivery, pollution removal, and the development of new catalysts for chemical reactions. Recognizing these prospects, the researchers have founded a spin-out company called Disruptive Materials to commercialise and apply Upsalite. We report the template-free, low-temperature synthesis of a stable, amorphous, and anhydrous magnesium carbonate nanostructure with pore sizes below 6 nm and a specific surface area of ~ 800 m2 g?1, substantially surpassing the surface area of all previously described alkali earth metal carbonates. The moisture sorption of the novel nanostructure is featured by a unique set of properties including an adsorption capacity ~50% larger than that of the hygroscopic zeolite-Y at low relative humidities and with the ability to retain more than 75% of the adsorbed water when the humidity is decreased from 95% to 5% at room temperature. These properties can be regenerated by heat treatment at temperatures below 100°C.The structure is foreseen to become useful in applications such as humidity control, as industrial adsorbents and filters, in drug delivery and catalysis. Amazing properties may be due to the fact the equator of the sun is producing extraordinary cosmic rays, the completion of the reversal will reveal all. Nice material - desiccants are also used as insect repellents of a sort, so if they were cheaper and nontoxic, so much the better. I'm now wondering if those little packets in beef jerky could have this stuff in them instead of silica packets and be labeled "You Probably Don't Want To Eat This But Hey We Can't Stop You So Knock Yourself Out." Recently zeolite is started to be used in home energy storage systems. When water is added the zeolite grows warm and this heat is used to heat water in homes. When excess energy is available (e.g. from rooftop solar panels or waste heat from gas turbines) the zeolite is dried out and stored. The big advantage is that dry zeolite can be stored indefinitely/safely and will retain its ability to deliver heat until water is added. It is not aggressive and non-toxic. This article suggests that MgCO3 outputs less heat when water is added but can take up more water. So it would be interesting to check what the energy balance looks like and whether we should replace zeolite with magnesium carbonate. A new julianpenrod sock puppet? I wonder how many other new discoveries are overlooked because an experiment didn't proceed as predicted. I understand this was an accident, but why was it an accident? Why didn't they plan and predict this process? I don't mean to be critical of the folks doing the work. I want to point out that much of what is learned is from mistakes, failures and looking very closely at anomalies. A classic case is Silly Putty. It a failure for making tires but an economic success. Same for the adhesive on 3M Sticky Notes. As early as 1820, people started to search for lower-temperature routes to make dry MgCO3, but none have successfully yielded pure product until now. So it's not like people haven't been trying. The number of free variables for producing something are very large - and therefore you use the approaches which seem most promising going by things learned from other materials or simulation. But those approaches aren't perfect (our chemical simulators aren't 100% perfect, and materials that have similar chemical properties may show wildly differenr synthesis behavior). You can't always 'plan' something like this. Occasionally it's just happy accident that leads to discovery. That said: The methodical approach leads to discovery a lot more often. The methodical approach leads to discovery a lot more often. But one learns more from why a process failed. Back to Flieshman and Pons, were they lying or did something happen they didn't understand and difficulty repeating? Today's 'science' seems to discard the unexpected results. Which shouldn't be construed to mean that one should set up experiments expressly to fail. You learn from the UNEXPEXTED failures. The failure of experiments is seldom reported. But sometimes people DO write papers on it (which I think should happen more often, as it helps researchers elsewhere avoid making the same mistakes). But printing space in journals and author time in conferences is limited - so these venues tend to feature publications on stuff that works (can't really blame them for that). As the history of this experiment has been well researched itself it looks like they got a fluke reading and they didn't double check/published prematurely - including a lot of conjecture as to the cause of the readings. I don't think they wanted to lie outright (whatever for?). It was just sloppy science. Boss: "I need to see you in my office"
Boss: "No, you're getting your name on a patent"
Which shouldn't be construed to mean that one should set up experiments expressly to fail. You learn from the UNEXPEXTED failures. Go ask Honda about the half-decade that they spent on the NR500 program. Mountains of yen were spent, many parts were consumed, with repeated dismal very public failures. They had done the math before beginning, knew that it could not succeed as desired, yet they pressed on. They learned a LOT. Many unexpexted problems can lead to enlightenment, even if you're just digging the same hole deeper and deeper. The real wisdom is knowing when to change directions. Could this be used to smooth-out the moisture content variations in soil? I think that might be true if the soil in question regularly hit 95 degrees Centigrade. Maybe some day they'll make some that will give up stored moisture at 65F...after all, nothing is "impossible". If anything, it would be good to make a "tunable" model that could be tailored to what is needed - You'd have a problem of uptake versus release; as it dries out, it will continue to pick up some of the moisture it releases, depending on humidity. If you made it temperature-stable at a low level, it could maintain some humidity at less than 100% without completely drying the air out. "it will continue to pick up some of the moisture it releases,"
Unless the crop root system gets it (the moisture) first?? See, they actually have a word for it. It's called "serendipity". How they came up with that word was, itself, probably an accident, but hey, if it wasn't for mistakes, we wouldn't have Penicillin. MgCO3 can attach up to 5 H2O i.e. MgCO3.5H2O, if my calculation is correct, in theory 1 kg of MgCO3 can absorb approx. 1.6 kg of water, is it a lot? 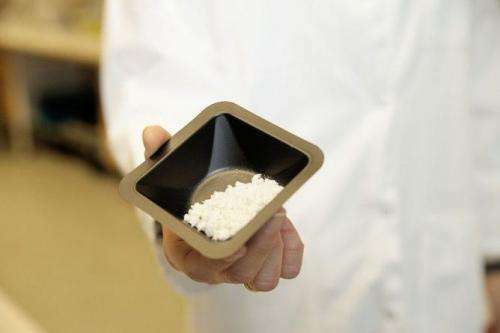 There is no density provide in the new product but seems very low, it will take a lot of room to hold 1 kg of the new form MgCO3.